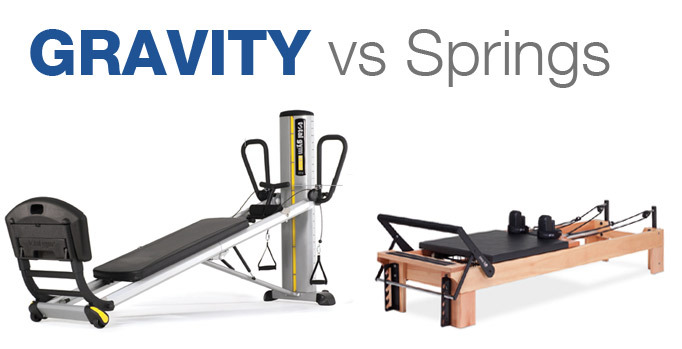 We often get asked to explain the difference between the results of training on other devices such as the Pilates Reformer or the BowfLex. Here is an explanation. Please feel free to contact us for further clarification on the subject. For example a Courier Driver, a Mom with kids, Office worker, and a Rugby player all have different training and conditioning needs to prepare for their “functional movement needs”. Total Gym: Incline plane bodyweight training devices like the Total Gym use an individuals’ bodyweight as resistance against gravity, utilising a dynamic cable pulley system and free rolling glideboard on an adjustable incline plane. Bowflex is a multi station piece of exercise equipment that either directly or through various pulleys uses flexible “Power Rods” that bend and provide a spring like tension as the means of providing resistance. Pilates reformers use a free rolling glideboard usually on a horizontal plane which is connected to one or more large springs to provide resistance. The best way to explain the difference is by examining the force on the muscles through the range of motion of the exercise movement. With a spring type device when a force is exerted at the beginning of the movement the load on the muscle may be zero or if pretensioned perhaps some amount more than zero. Part way through the movement the force increases and at the end of the movement the maximum force of the extension of the spring is reached. This is called a linear force. So when a user of this type of system (spring based resistance) experiences the movement, they might observe that it feels hard to do and after several repetitions will feel like they have had a “good” workout. The question is – Is it a “good” workout? This type of exercise runs the risk of developing unbalanced muscle structure and strength – weak one end and strong at the other. It just isn’t functional. It only really challenges the muscle at a certain part of the movement –e.g. hardest at the end of the movement – but what about the beginning and middle etc? Take for example a simple everyday activity of a busy Mom, who will pick up and put down a baby several times a day, a basket of laundry or bag of groceries. The baby, the laundry and the groceries all weigh the same at the beginning of the movement, the middle of the movement and at the end range of movement. When training a functional movement pattern (training movement for life) using bodyweight incline plane training on say Total Gym the resistance is nearly constant – the muscles spindle cells and fibres throughout the whole muscle are placed under load in an even manner, done correctly the result will be hypertrophy (growth) and improved strength throughout the full range of the movement and the full length of the muscle, making for a more effective workout. Prolonged training with a spring force has the potential to create an unbalanced muscle development, meaning hypertrophy and muscle fibre development is excessive at the end range of movement and minimal at the beginning. I’m not saying in particular that spring type training devices are bad and obviously they have a lot of users. exercise should be spent wisely and efficiently. I recommend that people do not waste their precious time on “non- functional “exercise with the risk of developing unbalanced muscle structure, weak on one end and strong on the other. Learn how to train for the function required of your own body, which in general means exercising every muscle in the body evenly in some form or other. The Total Gym does that very effectively. Greg Doherty, a native of Canada, grew up on the West Coast of British Columbia. After attending the University of Victoria where he studied Science, Physics and Chemistry. Various careers leading on from that gave Greg a well-rounded background in his early days, which include a commercial fisherman, an engineer’s assistant on roading projects and a salesman. Coming from a family of salespeople with two generations in retail he was a natural. Greg then became a carpenter and joiner and spent a few years in the construction industry in Canada. Eventually he moved into the boat building industry where he built and repaired boats. As Greg has always had a keen interest in marine activities, he and his wife Nancy decided to sail to New Zealand via the South Pacific (via Marqueses, Tahiti and Tonga. They decided to settle down in New Zealand and began building a career, which evolved to the business they have today. Greg has completed C.H.E.K Level 3 and CHEK HLC Level 3. Greg’s role as CEO involves focusing on networking, building key relationships with businesses partners throughout Australasia, consulting on studio fitouts, quotes, site visits, planning and upper management decisions. This entry was posted in Functional Training, Personal Training, Pilates, Total Gym and tagged functional training, Pilates, total gym by HQH Fitness. Bookmark the permalink.